Most of you by now will have seen the riveting trailer on TV or the great posters in the streets. The Two Faces of January, written and directed by screenwriter Hossein Amini (Drive screenplay) in his directorial debut, is out on release this Friday 16th May... and we couldn't be any more excited. A thriller centred on a con artist, his wife, and a stranger who try to flee a foreign country after one of them is caught up in the murder of a police officer. The film is based on the 1964 novel by Patricia Highsmith, and is already being described as one of the most beautiful and enigmatic thrillers to be hitting the cinemas. Dean and I, along with the rest of the team at The Morrison Studio are delighted to have been able to design and produce the main and end titles for the film. Work for us began some time ago after meeting with both Hoss and producer Robyn Slovo, who insisted we do the titles after attending a screening for HBO's Muhammad Ali's Greatest Fight, directed by Stephen Frears. Robyn liked our title sequence for the film so much, she requested the meeting to discuss what we could do for their new film. 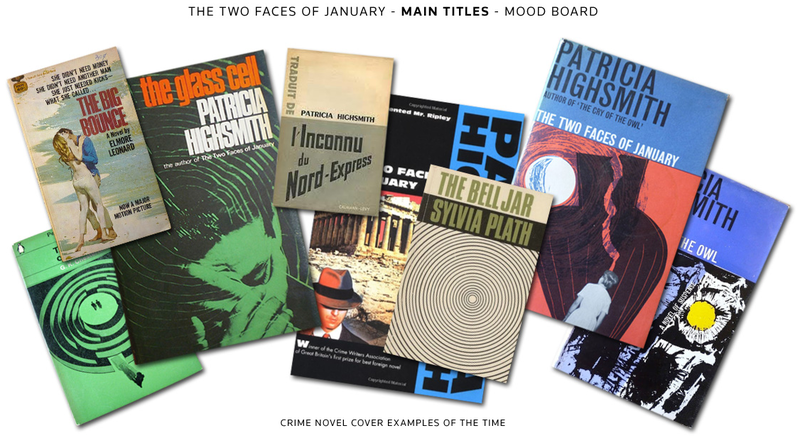 So we set out researching the genre in the time period of the film, along with book jackets from Patricia Highsmith's books as reference. It became apparent that typography and the way we set it was going to be the main focus for us. But we were keen to also see if there was a graphical way we could introduce the first few credits before the opening live action shots. So we started to explore various styles and colours to get the right look we were after. From our research at the beginning, it became clear that 'circles' was a good direction to start. With the gift of Working Titles' animated logo leading us into the first credits, it naturally felt right to evolve the style of the sequence from their logo. Combining the right colour palette with the right typeface suitable to the genre, we developed moon shape slithers to slowly rotate concentrically. Then we placed the titles in the negative spaces to create a design based on crime novel book jackets of the 1960's. The circles were also a good metaphor for the three key characters, who's romantic journey of deceit and deception would take them full circle to tragic circumstances. The creative process however, twisted and turned - a lot like the plot of the film. And as the film's editing changed, we needed to rethink the titles to something more simpler, yet still stylish. Which will be revealed when you see the film. We kept the colour palette and the typestyle, and we are very pleased with the way it all looks. As simple as it might be... we have a look which compliments the film very well. We hope you enjoy, and we look forward to sharing our title sequence with you in the very near future. Note: All images remain the property of their respective owners. Copyrights apply.